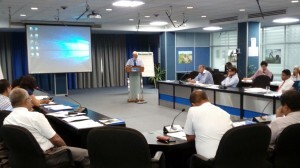 A consultation on application of the South Asia Drought Monitoring System (SADMS) developed by IWMI under a GWPO/WMO supported initiative was held on 26th September at IWMI Headquarters. The consultation organized jointly by IWMI and SLWP was aimed at familiarizing the SADMS tool as a decision support mechanism for drought monitoring in Sri Lanka among meteorological, irrigation, agriculture, water supply and disaster management policy makers and for obtaining their views on the usefulness of this platform for drought monitoring including forecasting. Ministry and agency representatives including from donors such as JICA, USAID and UNDP attended the event .Sector agencies have expressed interest in take up of SADMS for drought monitoring and SLWP will be following up on issues related to operationalizing SADMS in the future.